Addressing fatigue through Applied Kinesiology, biochemistry, and nutrition. Fatigue is an ever present complaint for many people. In this paper I’ll describe how we make and use energy, how nutritional deficiencies cause fatigue, and a protocol that I use in my practice to identify these nutritional deficiencies. For many people this protocol can produce dramatic results in a week. This is something that I address with all of my nutritional clients. While everyone can benefit, people with chronic illness, environmental sensitivities, and Chronic Fatigue also should refer to my papers on dysbiosis for further help and understanding. Our bodies produce energy through the metabolic processes of the citric acid cycle and the electron transport chain. When the citric acid cycle and electron transport chain are not working properly other complaints can occur besides fatigue. The citric acid cycle and electron transport chain produce ATP (adenosine triphosphate). ATP is the molecule that our cells burn for fuel. If the body is not producing enough ATP it then feels fatigue. 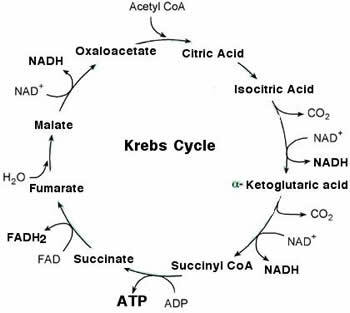 The citric acid cycle produces alpha-ketoglutaric acid (AKG). AKG produces glutamic acid which produces L-glutamine. L-glutamine is an amino acid which is necessary for the growth and regeneration of the intestines. As such it plays a major role in the treatment of Leaky Gut Syndrome. Glutamic acid also produces GABA (gamma-aminobutyric acid). GABA is a major inhibitory neurotransmitter. If it is not found adequately in the body, people will complain of anxiety, shaking or trembling, and that they feel as if they are at the end of their ropes. Low GABA will also cause seizures. The citric acid cycle produces aspartic acid, which is needed for the urea cycle and the removal of ammonia from the body. If the urea cycle is not working properly, symptoms include gouty arthritis, kidney stones, glaucoma, and frequent urination especially in the middle of the night. Carbon dioxide (CO2) is also needed for the urea cycle. The citric acid cycle is the major producer of CO2 in the body. Our respiratory rate is not regulated by how much oxygen is in the blood but how much CO2 is in the blood. As a result of low CO2 in the bloodstream people will not breath deeply. This may lead to hiatal hernias. If the citric acid cycle isn’t working properly, the body relies on glycosis to produce energy. As a result many people crave and eat starchy food and sugar, looking for an energy lift. Glycosis doesn’t produce much energy. It burns fast, leaving people more tired than when they started. Starchy foods and other stimulants, like coffee, tea, and cigarettes, cause more stress on the adrenals, pancreas and liver. Carbohydrates, sugars, proteins, fats and oils are metabolized in the citric acid cycle and electron transport chain to produce ATP. Carbohydrates and sugar are digested to form glucose. Glucose burns rapidly, producing a tiny amount of ATP and the molecule pyruvic acid. Pyruvic acid enters the citric acid cycle, which is also known as the Kreb’s cycle, to be metabolized with oxygen to create riboflavin (B2) and niacin (B3) based coenzymes. More ATP is produced in the citric acid cycle. The B2 and B3 based coenzymes (FADH and NADH) then enter the electron transport chain to produce a final large batch of ATP. The citric acid cycle and the electron transport chain produce 18 times as much ATP as glycosis. As we digest proteins, we separate the amino acids into their individual forms. These proteins are used by many processes in the body including the production of energy. The first step in using proteins for energy is to remove the amino radical. It is called deamination. These deaminated amino acids then enter the citric acid cycle and electron transport chain and are broken down into ATP. Fats and oils undergo a similar process when they are split into ascetic acid and are broken down in the citric acid cycle and electron transport chain. NUTRIENTS NEEDED FOR THE CITRIC ACID CYCLE AND THE ELECTRON TRANSPORT CHAIN. Clinically, supplementing with all the nutrients is counterproductive. Flooding the system with unneeded nutrients only reinforces the imbalance at the root of the deficiency. It is important to treat an imbalance with the specific nutrient or nutrients the person is lacking. Usually people are deficient in not more than two nutrients. The first step in finding any nutritional deficiency is to locate a weak muscle. To screen for low citric acid cycle, we have people rebreath in a paper bag. Rebreathing in a paper bag increases the amount of CO2 in the body. If rebreathing strengthens a weak muscle then we know the body could use more CO2, and since the major producer of CO2 in the body is the citric acid cycle, we can infer that it is not working correctly. We then test for citric acid and alpha keto gluteric acid to see which pathway and which nutrients are lacking. We’ll then test for nutrients in the electron transport chain. Once we arrive at the nutrient or nutrients that strengthen a weak muscle, we supplement the patient’s diet with them. I recommend staying off of stimulants, sugar, and a high starch diet. I keep in contact with clients, and if a person feels better and then worse in a week or two, I’ll recheck nutrients for the electron transport chain. If after a month or two people feel tired again, I’ll recheck everything to find the next deficiency. Chronic Fatigue Syndrome is a term used for chronic debilitating fatigue lasting 6 months or more. It is accompanied by allergies and environmental or chemical sensitivities. It can be effectively treated with Applied Kinesiology by treating dysbiosis, and then addressing underlying toxicities. If you are going to treat yourself, realize that you are unique and what has helped others may not help you. When you try things, if you feel worse or there is no change, discontinue and try something else. If the supplement makes you feel racy, unable to sleep, or “energized,” discontinue. The supplement is having a stimulant like effect and will drain your adrenals even more. Ideally you should experience a relaxed increase in energy and alertness. If you don’t get the results that you need, make an appointment with me. These suggestion that I have included will not address an underlying nutritional deficiency, but may help people manage their fatigue better. Avoid Korean, Chinese, or American Ginseng. These herbs have a stimulating effect on the body and can be dangerous over long term use. Try Siberian Ginseng. Siberian Ginseng is not a true ginseng and works differently and more gently on the body. It may help your body adapt to stress. Don’t take herbal formulas with stimulating herbs. They usually with names like Up Yer Gas(oline), Men’s Power Pluss, and Pure Energizor. These products will fool your body into producing energy it doesn’t have, causing damage to your adrenals. Some stimulating herbs to stay away from are Gota Kola, Ephedra, Ma Huang, Gaurana, Yohimbe, Ginseng. Try kidney yin tonics. These traditional Chinese herbal formulas usually have Rehmania as a main ingredient. They can work by replenishing the body, helping it rest, and gradually helping the person regain energy. If there are problems or no change, then discontinue the product. Avoid multivitamins. I usually test at least 4 or 5 multivitamins by the same company before I find one that test well. Try Pantothenic acid from a good vitamin company. Pantothenic acid tests in about 30% of the time that I test citric acid cycle function. If there is no change using it or other supplements, discontinue. Do not use DHEA without lab tests to show a need for supplementation, and with a doctor’s supervision. Dehydroepiandrosterone (DHEA) is a steroid hormone produced by the adrenals. While studies have shown that supplementing DHEA benefits some people, it can harm others. Side effects include adrenal suppression, rashes, infection, and lung problems. Try bitters. They help stimulate the digestive system. Stop all sugar and caffeine. Reduce starch intake. Eat more protein. Protein will help some people that crave sweets. Keep notes on foods that you may have sensitivities to and eliminate them from your diet (most common are milk, dairy, tomatoes, wheat, corn, garlic, and onions). This work is based on the work of Walter Schmitt, DC.